Claude and Sir Bobblysock set out on their first visit to the city. On day one, they visit a fancy cafe, discover the best beret shop in the world, visit an art gallery, and witness an art theft. Will Claude and Sir Bobblysock have what it takes to foil the robbery? The next day, Claude rushes a sick Sir Bobblysock to the hospital. Quirky characters and a play on words with the doctor's name will have young readers snickering at every turn of the page. The pen and ink illustrations are a throwback to early readers of the sixties and seventies. 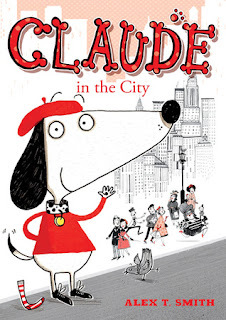 The strong writing will make parents wish their first books had been as charming as Claude in the City. The splash of reds give the book a cartoon-like feel. It's almost impossible not to fall in love with Claude. A HIGHLY RECOMMENDED early reader. One of my lucky readers will receive a copy of Claude in the City. Please use the Rafflecopter form to enter. By entering, you acknowledge you have read the terms on the Rafflecopter form and agree to them. Contest ends April 26, 2013 at 11:59 EST. **I received the book at no charge from the publisher to facilitate the review. No monetary compensation was exchanged and I was in no way obligated to give a positive review. I think he would love the drawings. I think my niece would love this book because it seems like it a lot of fun adventure in it! That it is funny and it plays on words. My Grandson loves funny books. I do too! I have 5 kids they love all books ESP animals in them. My son would love that it is about a dog. The illustrations and the story itself! my son Aaiden would love its about a dog. Or as my 1.5 yr old doggy! My daughter loves animals, so she would enjoy a story about a dog. My daughter loves books...especially ones with animals in them or as the main character. My daughter would love that it has a dog in it! She is an animal lover! We love dogs as characters. My grandkids would like Claudes friend Sir Bobbly socks....its fun to say! I think that my girls would like this book because it looks fun and has a dog on the cover. My kids like dogs, looks fun. My son Ricky would love it because the main character is a dog!